"I'm pretty sure I've invented a time machine. All going according to plan I'll materialise right here at 11.37am on Friday. This is just a courtesy note to make sure you're not standing in this spot at the time." Could this be any better? On the one hand, I totally agree with him on the kite issue, (waaaaayyy too much effort to entertainment ratio), and I could take on all the cheese-related activities, thus freeing him from something he obviously finds odious. This alliance has symbiosis written all over it! There's only one snag in the plan I need some help with. What with my expired passport, and time differences and such, I doubt I could show up at the right place in time for the rendezvous. (Hell, he's going to appear in only 11 hours and 3 minutes.) So, if anyone in Melbourne is reading this, would you kindly show up at the appointed place and time and ask Craig to email me? You will be compensated generously (ok, semi-adequately). P.S. That spatchcock he mentioned had me worried for a minute, but it turns out to be "a chicken or other fowl that's had the backbone and ribcage removed in preparation for grilling." Hmmmmm! Spatchcock! For a minute there were you hoping the spatchcock was some kind of Wenie Whistle? He tries not to think about the weenie whistle. 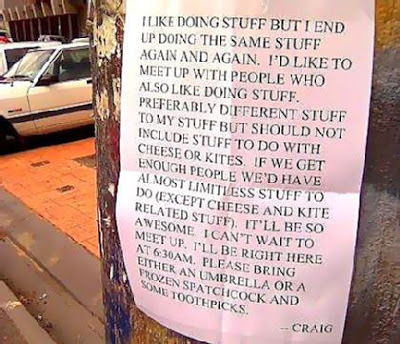 Y'know, it looks to me like "Craig" is a prankster or a performance artist, not the usual nut we seem to run across, and so I wish him success. I hope he ends up with a very nice photograph or video of a few dozen playful, cheery people who have shown up with their frozen chickens and umbrellas. Even if he doesn't, his flier makes the world a little happier and more interesting, doesn't it? He made my world a little happier since I had no idea what to write about until I saw the article this morning. Well, you know, if he has a time machine he could go back and file the application for a passport for you in time to get to Australia to meet him. You know, if he was doing his job.